Borrow objects, alter them magically, then return them in their permanently altered state. To use an analogy, out here, in the magic frontier, the crowds thin out. Just as in the wild west, where the cowards stayed home and the weak died on the way, going this far isn't easy. But don't worry, magic isn't nearly as demanding as the wild, wild west was. Here, the biggest challenge is the willingness to plan ahead, because that is the most important thing this principle demands. My first adventure with this sort of thing goes way back to my handling of the Pencil Thru Quarter (see page 161). Bob Nixon, in an issue of the MAGICAL ARTS JOURNAL, gives a wonderful example of this principle. There, he printed his method for secretly bending a borrowed key, but in my tridty is a riot, and the sight of forty business men in a circle doing it reallybuilds a crowd. If you want, you can connect the cirde, letting off a Funkenring as you do, then revealing the key as being bent. By the way, I get rid ofthe bender as you might expect, by ditching it into the Topit during a simple gesture. A final example of borrowing an object, altering it magically, and then returning it in its permanently altered state, is to use Howard Lyons' Inside-Out Dollar Bill. This bill, cut from uncut sheets sold by the U.S. Mint, is a bizarre sight. Unless you are going to be giving away large quantities of these, you might want to buy one from your local magic dealer, offically marketed under the name "The Mismade Bill." This note-size rectangle is cut from a fresh sheet of bills, only, instead of following the intended boarders, you put the corners in the middle, and the middle in the corners. Harry Anderson had the idea of tearing a bii! into four quarters, and restoring it, only to find you had made the mistake of restoring it inside out! I cause the transformation to take place by relating it to the old trick of folding the biil up, then unfolding it to show it upside down. Going one step further, I volunteer to turn it inside out with the same method, At this point, perform the $100 bill switch, turning their bill inside out And yes, as often as possible, I try to convince them to keep it that way. (The by asking, "Howmanypeopleherehavehotelkeys Thumbtip Bill Switch is described on page 227.) with them ? "Everyone raises their hand. "Let me mind, more importantly, he gives the idea of returning the permanently bent key on a key-chain, which carries his name and address. Since getting this idea from Bob, I've used it several times for trade show clients. Instead of putting it on a simple plastic key ring, I used beautiful, customized solid brass key rings, commemorating the event, costing several dollars even when ordered by the thousands. The method I used to bend the ¿xr v is simple. 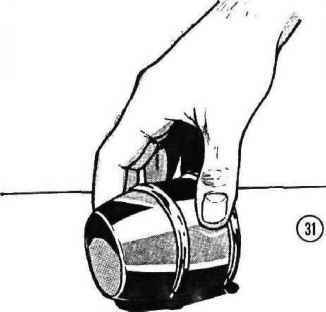 I used a bongo bender, which you can get from Magic Inc., only I cut the elastic off, and hid the small metal gimmick in my right hand. Upon taking the borrowed key with the left hand, I place it into the right hand, actually loading it into the bender. A gesture to the spectator with the left hand towards my right side covers the actions of the right hand perfectly for the instant needed. Once the key is bent, have the spectator hold out their left hand, and place the key into it, dosing their hand. requires tremendous amounts of channeled energie^P^' 1 noticed that unexpected reactions - for Mental, aswell asphysicalenergies. Sir, Tllneedto some odd reason - usually got a higher rating holdyourhand, andyou'llneedtoholdhishand, than the expected reactions. Eventually, I be-thenhe 'llholdhers, andonaroundL" gan t0 suspect the fact that the encounter that produced therea ction was ob viouslyunplanned was the very factor that resulted in this better-than-average response. My best responses were from unexpected interactions with volunteers, or with some obviously witty response to a spur of the moment event, or some magical resolution of an apparently legitimate problem.